As you can see, keeping up to date with my blog is not my thing! We have been so busy over the last few months I really haven’t had time to get around to it! However I am going to try and post once a week over the next month or so and try use my blog as more of a photo journal (as it is prettier) and a record of our life up here! 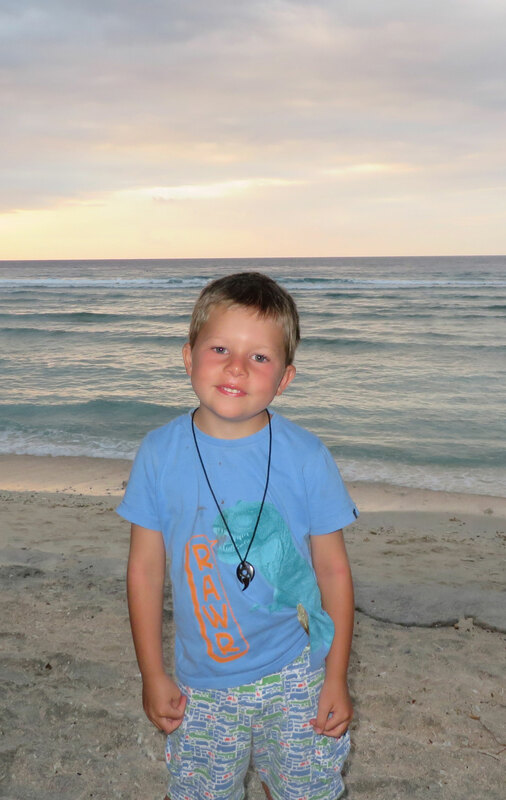 In September our lovely friends Lou and Laurie Walker and their two little boys Finn and Toby flew up to visit us! We had a wonderful week with them. 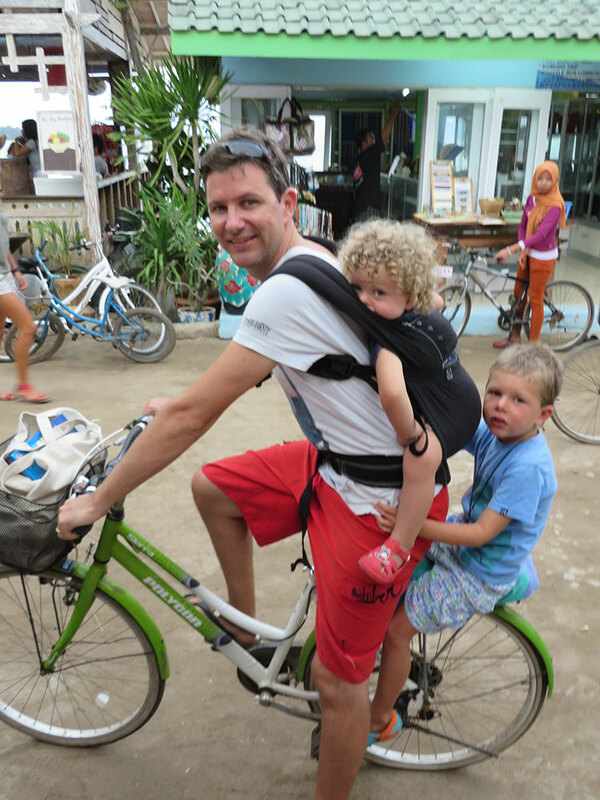 They spent two nights with us in Ubud and then we took a boat out the Gili Islands for 4 nights. We extended out stay by 4 more days and our wonderful friends the Kings came out and joined us! The islands really are quite special. 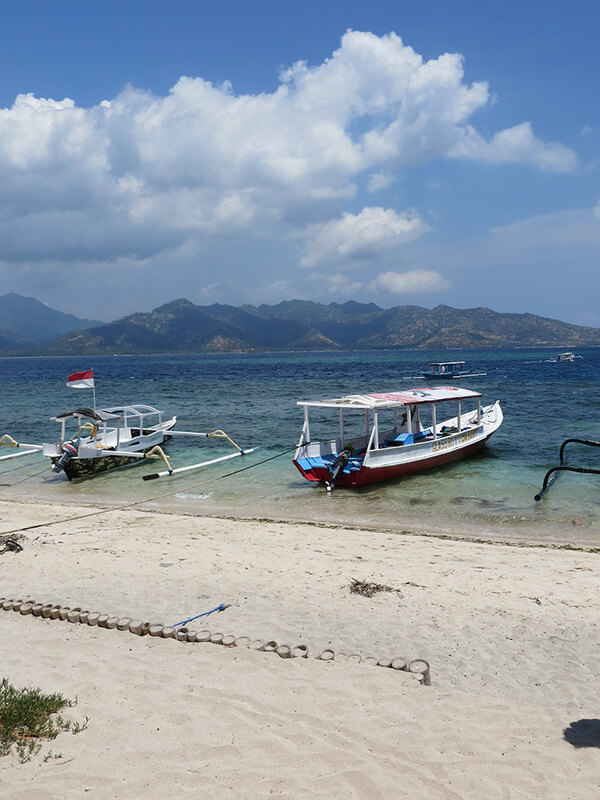 Not only are they visually spectacular, but there is the wonderful island feel and lifestyle that comes along the minute you step off the boat. There are no cars, only horse and cart and bikes. Time is of no interest to most people (for example your 10am boat might not leave until 11:30) and at times it feels like you have arrived at the last place on earth! 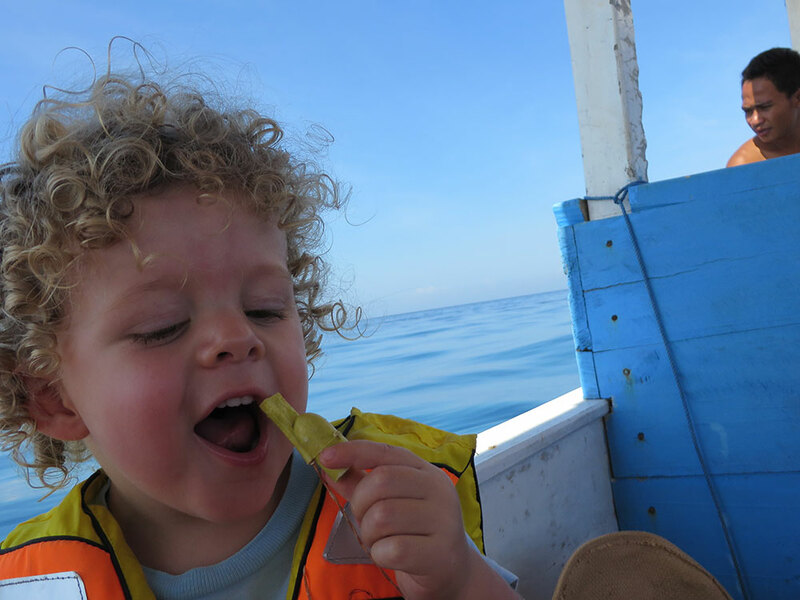 We spent most of our time swimming and eating (no surprises there huh?) 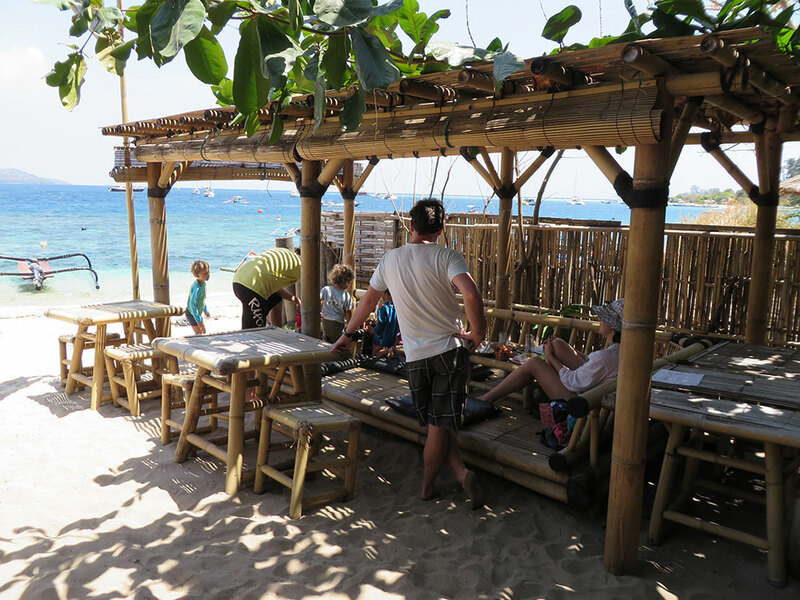 and thoroughly enjoyed all the restaurants on the beach where we could eat with our feet in the sand. The kids had a ball. 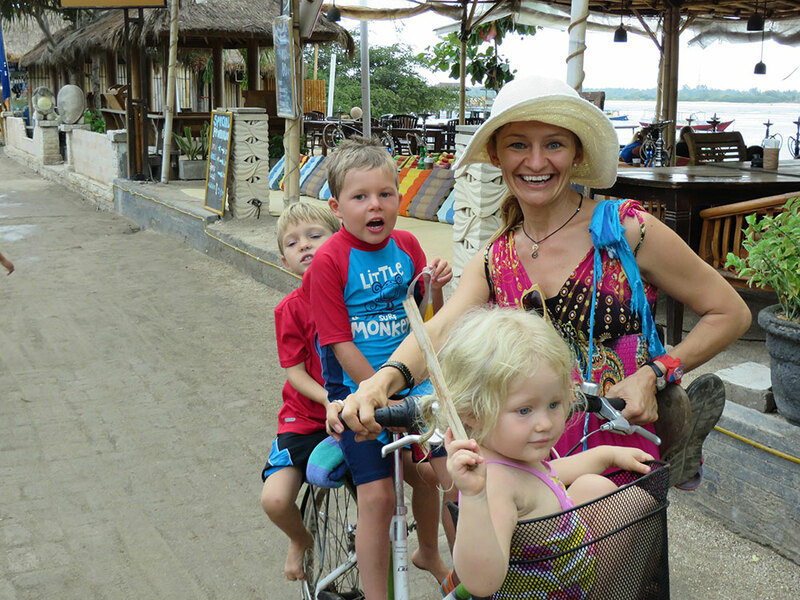 We rode bikes around and took a horse and cart for the longer journeys, of which both were equally exciting. Here are some photos of our trip. I can highly recommmend the islands. Definately something for your bucket list! 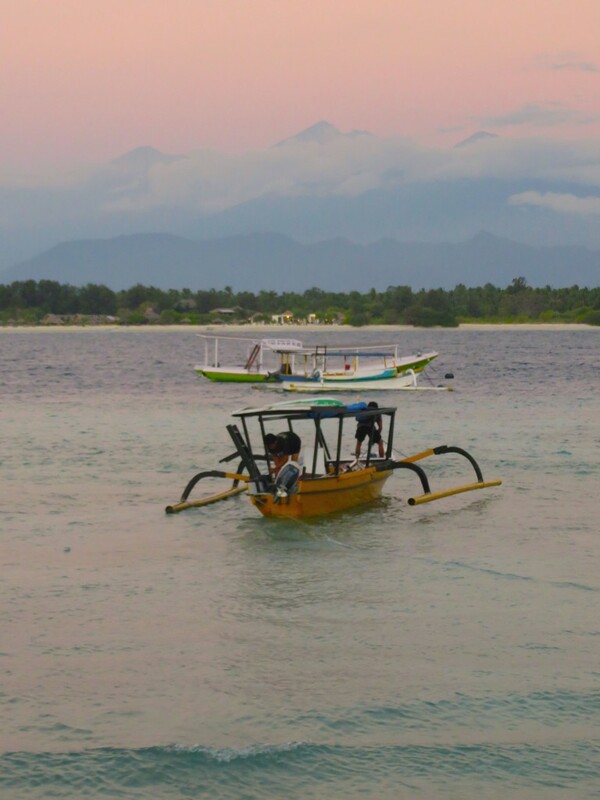 Beautiful Suset on Gili T, looking at Gili Meno and three mountain peaks on Lombok. It was our last night on the island. 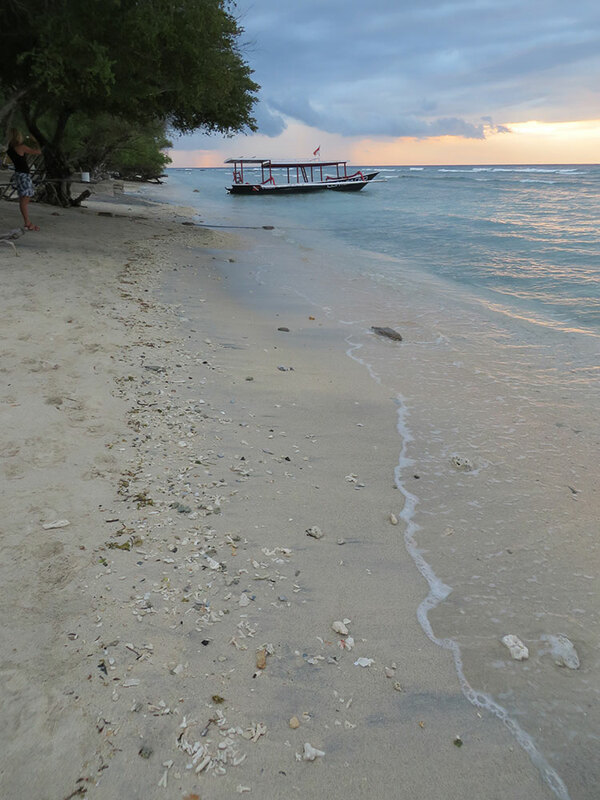 Feet in the sand, kids playing, happily. This was our view! 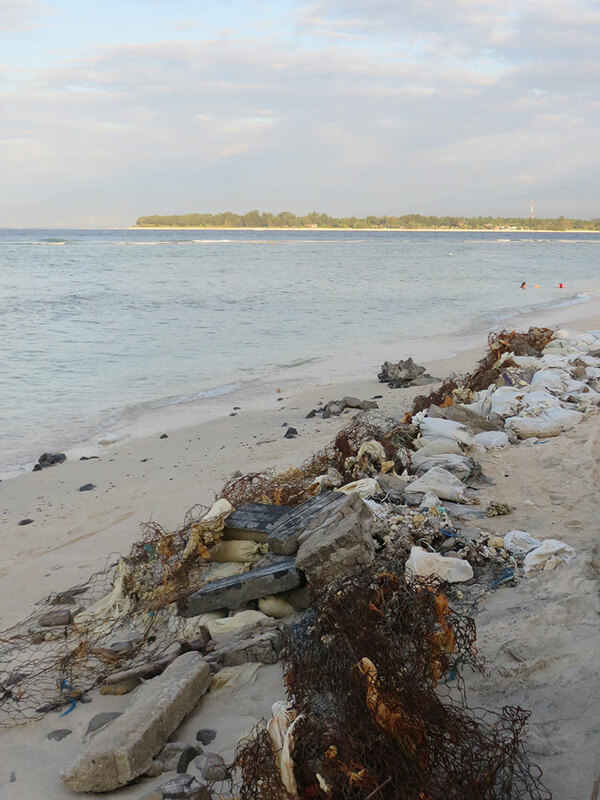 Photo from around the quiet West side of the island. 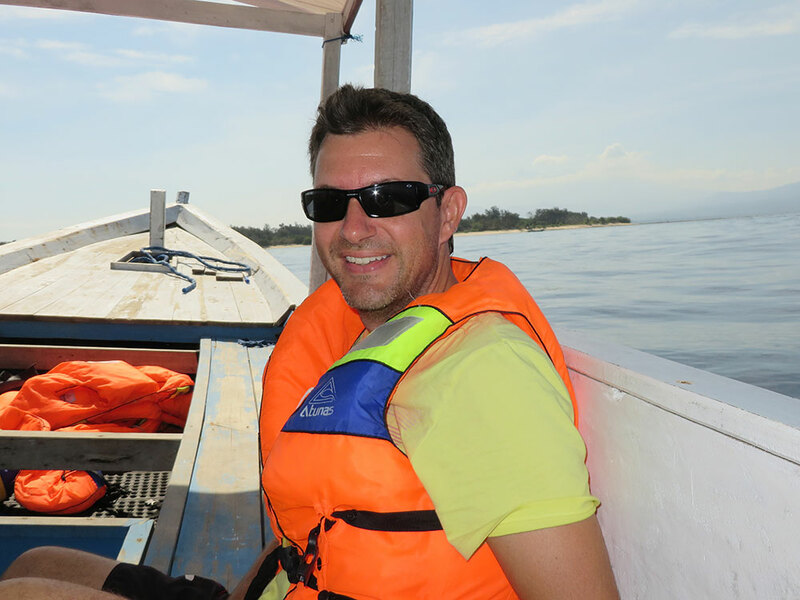 We took a beautiful boat around the islands and stopped along the way to check out a shipwreck (this photo) chase giant turtles and feed fish. 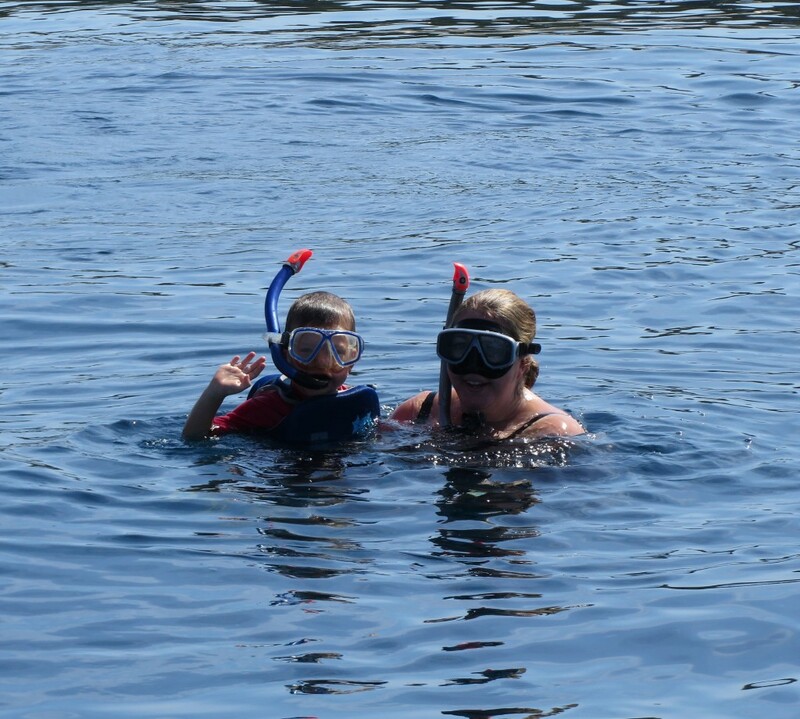 I was so proud of how enthusiastic Tom was despite it being the first time he had ever worn flippers or a snorkel and his first swim out in the middle of the ocean! The awesome foursome! 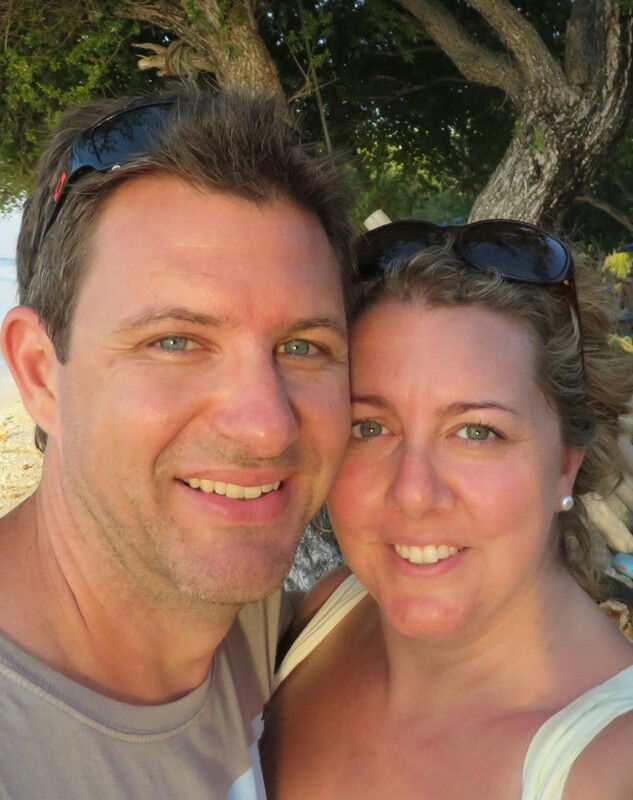 We went out to the islands with our beautiful friends, the Walkers. 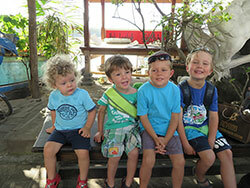 Our four boys Milo, Toby, Tom and Finn had a great time together! One woman actually GAVE me some bananas (right after this picture was taken) because she was so excited that I had FOUR boys … I didn’t have the heart to tell her they weren’t all mine! 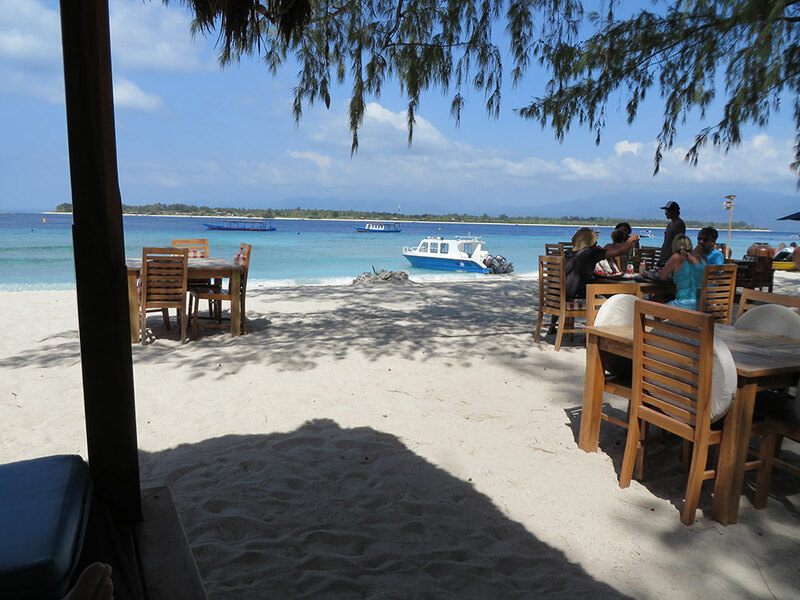 This was another lunch on the beach. 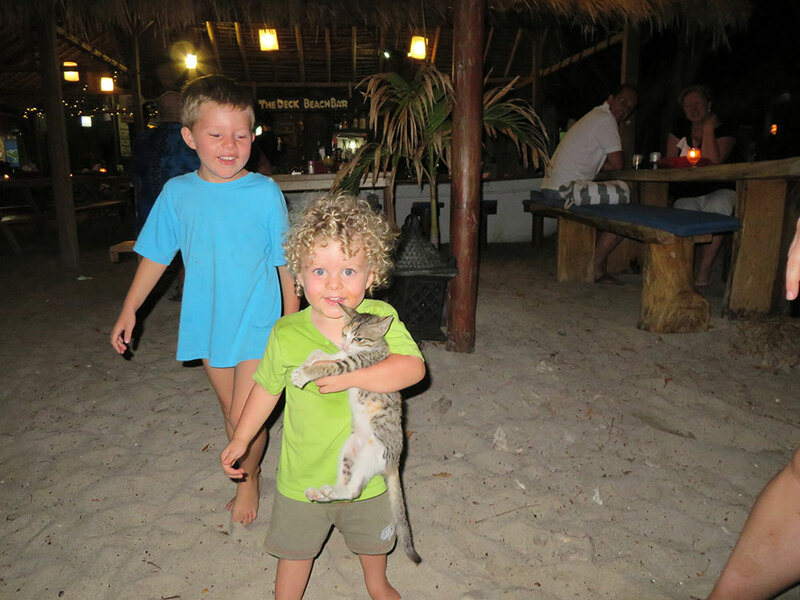 Tom and Milo had a great time running around chasing kittens and playing on the bean bags! Our two beautiful, happy little monkeys who had so much fun playing together! 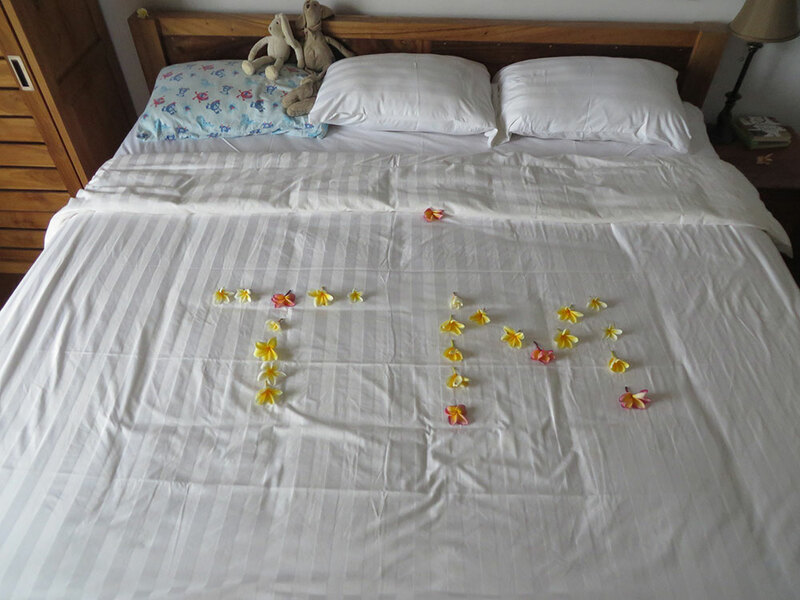 Especially when they were jumping on our bed!!! My beautiful big Tom playing on the beach at sunset. He was so excited about buying his necklace/pendant. It is the symbol for Gili T. Scott and I had just had a cocktail and were watching the boys play happily. It was a great night! 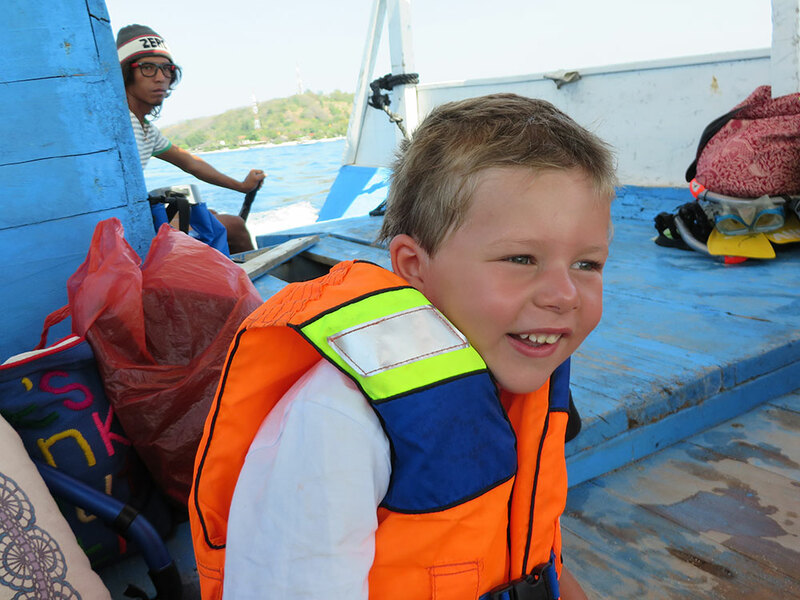 We took a boat trip around all three islands and had the most amazing day. 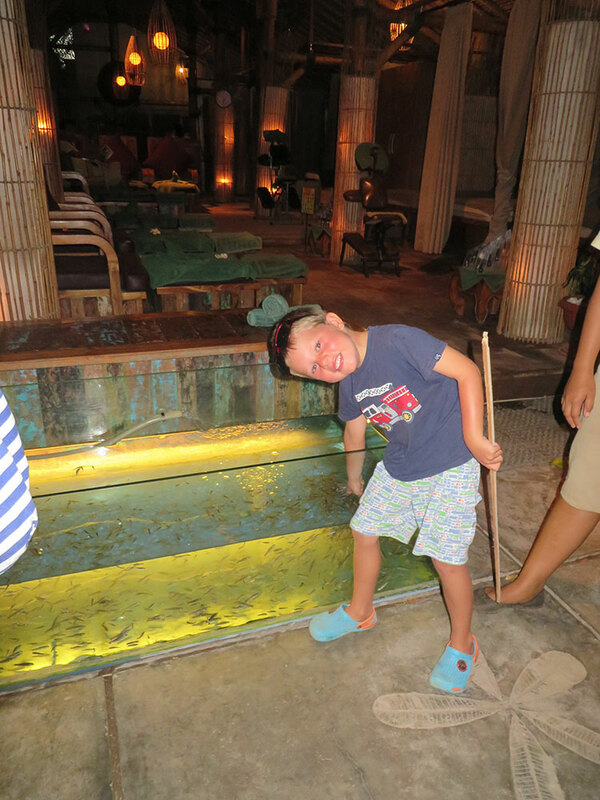 Snorkling, swimming, eating and relaxing with our beautiful little boys and our gorgeous friends! 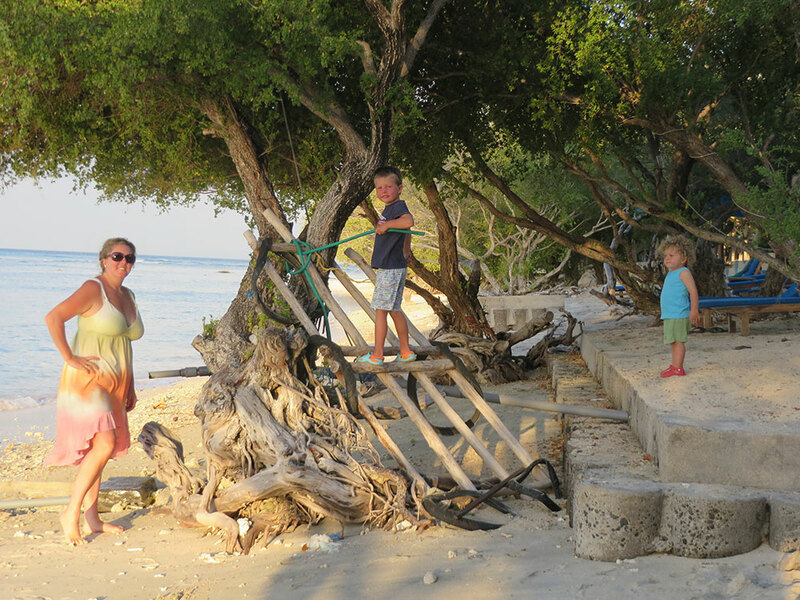 We caught up with the King family and spent a few days swimming, eating and enjoying the island with them. 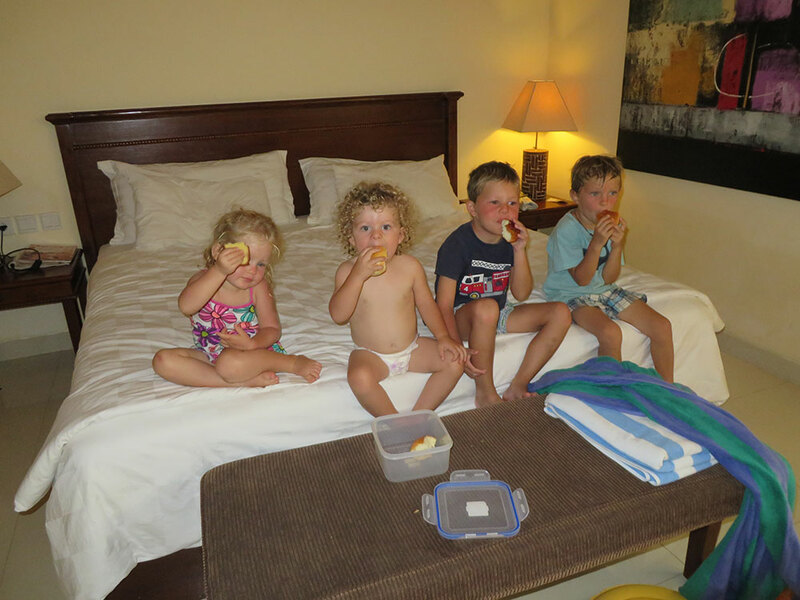 One afternoon the kids had all had a little bit too much sun and we popped them all on the bed in front of a movie while we chilled out on the verandah drinking beer and chatting! A bit of a win-win for all! 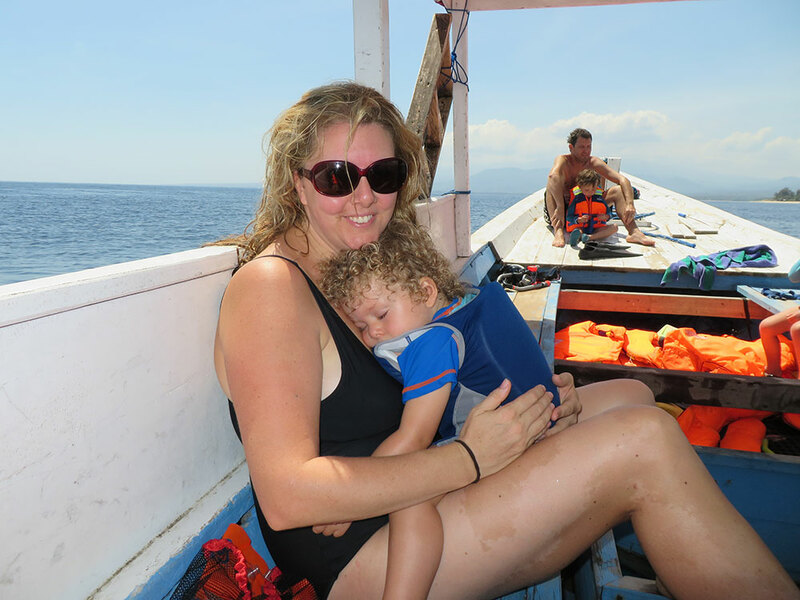 My beautiful Milo couldn’t make it through the day and had to have a little snooze on my chest out on the boat! No complaints from me! 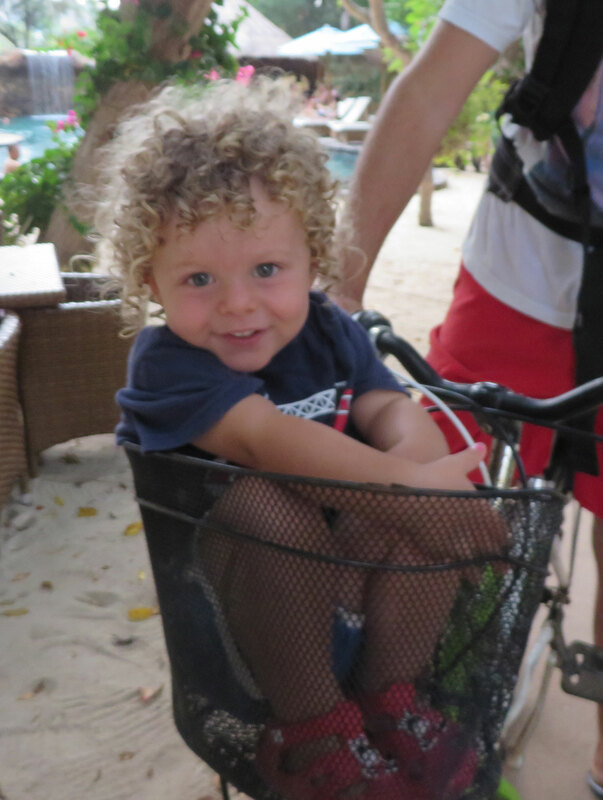 It was so lovely to just hold him for an hour while we cruised around! 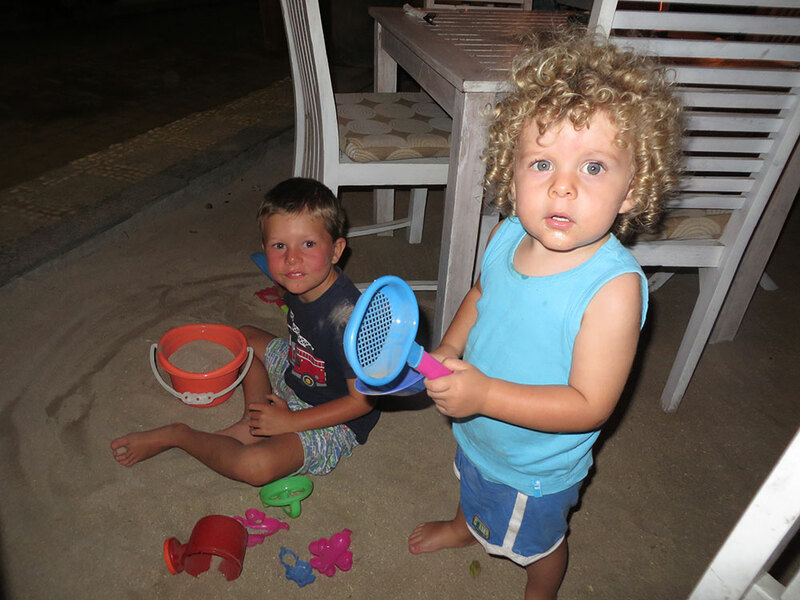 We bought the boys some sand toys to play with in the restaurants at night! have sand on the floor of a restaurant is the best idea ever! Milo just loves cats and little kittens. Everywhere we went he would chase them and usually catch one! I love this photo! It sum up his little face everytime he was ‘successful’. Tom was so proud of him for catching the kitten! The view from where we had cocktails in the evenings! It was breathtakingly beautiful. We travelled around the islands and this was the view from the boat! 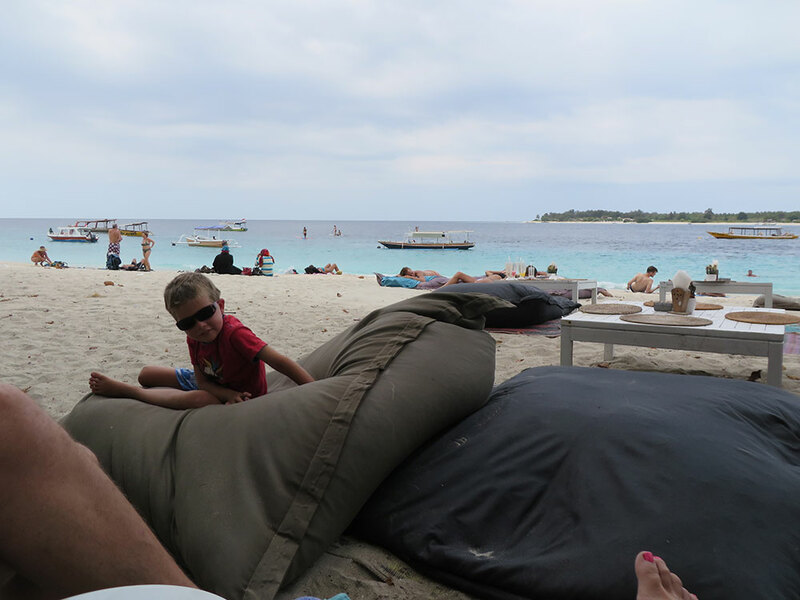 There are loads of restaurants actually on the beach where you can eat with your feet in the sand and the kids can run around! This was one of my favourites! 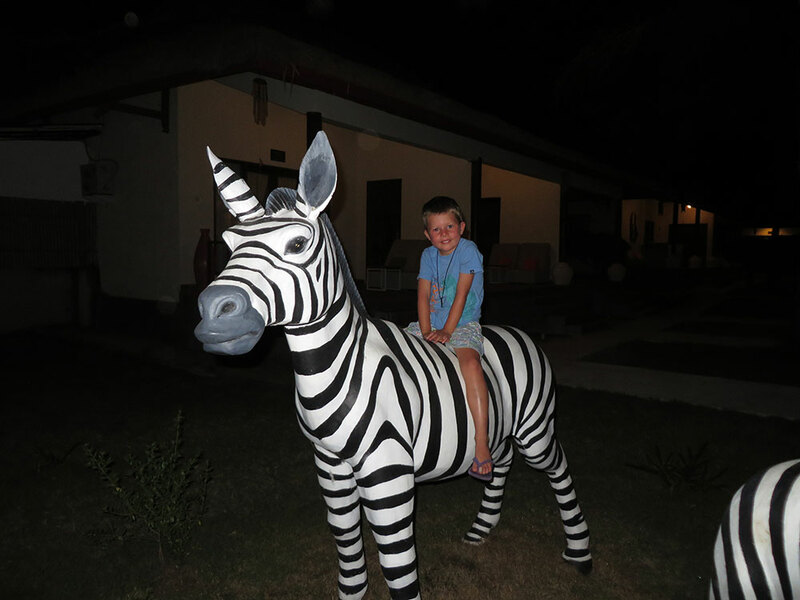 There are only a handful of ways to get around the island. This is one of them. The boys loved it! 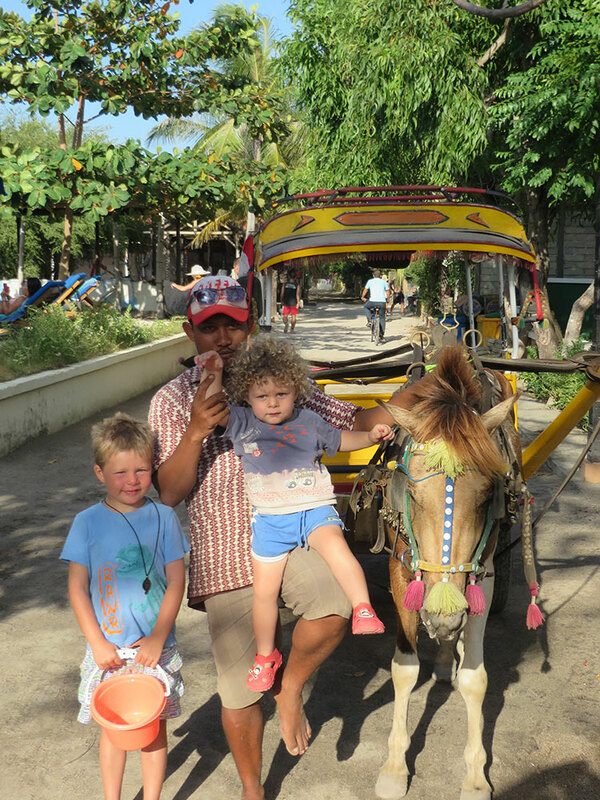 Another way around the island (good for longer trips) is Horse and Cart. The boys would often sit up the front with the driver and watch the world go by! It was so exciting for them! The Islands as just divine! 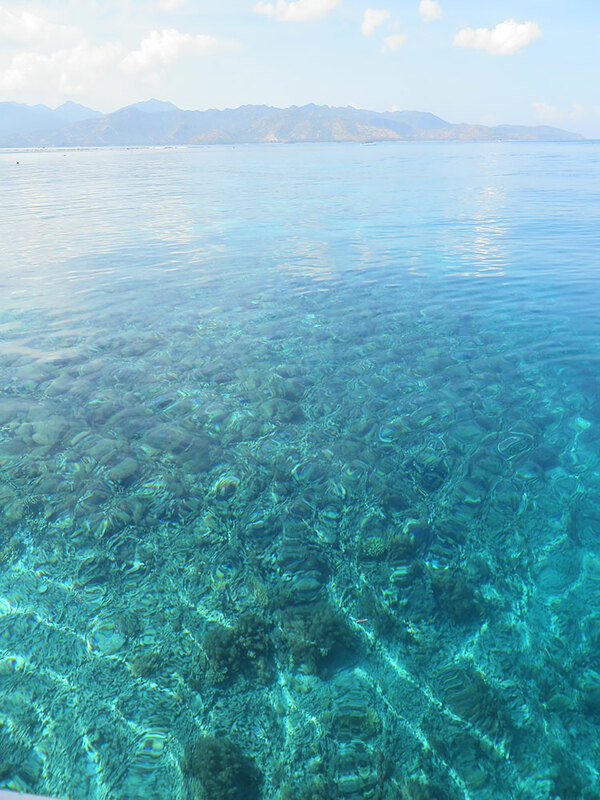 This photo is a little misty but you can see how clear and blue the water is! It is like this EVERYWHERE!!! 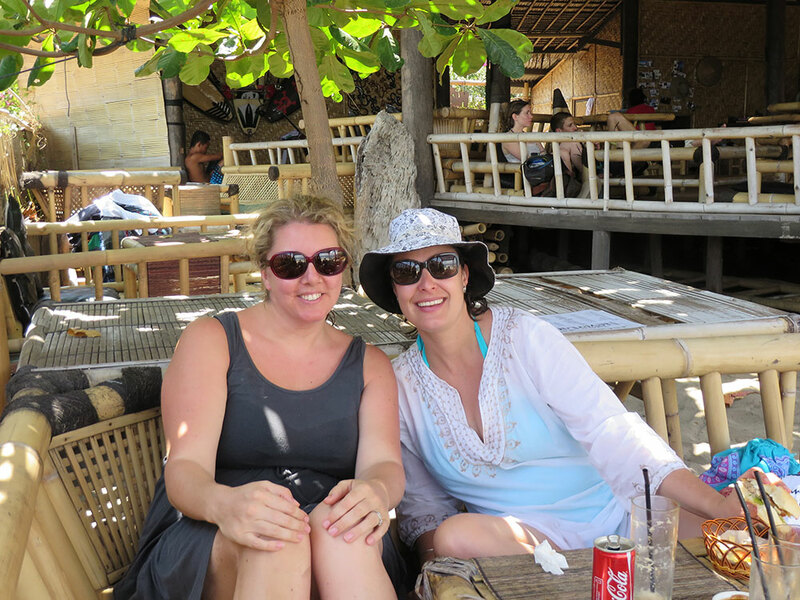 Lou and I having lunch at a little beach side cafe on Gili Air! It was wonderful to spend so much time together!!! Just a casual lunch scene with the 8 of us! As you can imagine All the boys (our two and the two Walker Boys) had an absolutely Ball! 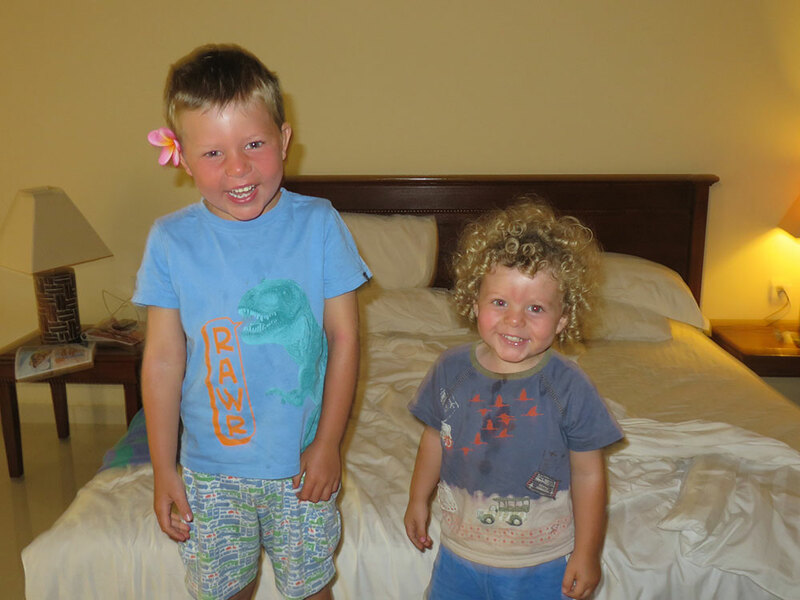 Milo and Tom just loved scrounging around and playing on the beach. 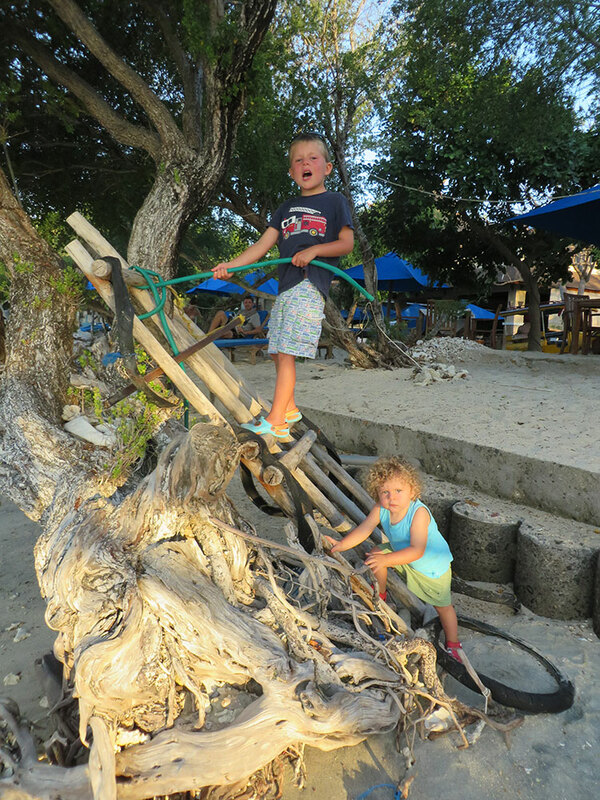 They would often run out of our hotel and straight out to this tree and both of them would climb it! This worked well for us as it entertained them while we had a glass of wine! 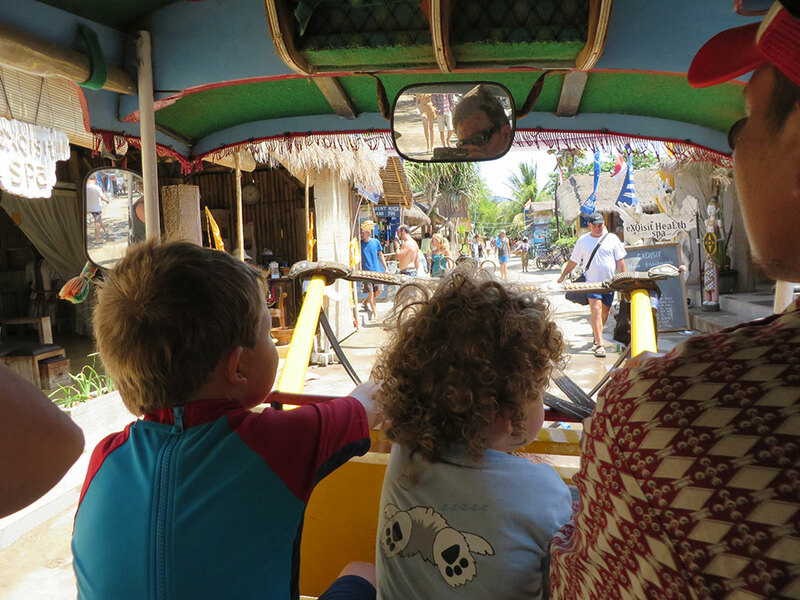 We made friends with a lovely guy named BCheng and he drove us all over the island. The boys loved him and we enjoying getting to know a local! My two little adventurers climbing their magical tree! What a great place for my happy little boy! Island love! We had the most wonderful time with our friends and our little family! Oh Jess it is wonderful! We certainly are living our dream! It so it! Looking forward to catching up when you get up here next year! Thanks hon! Definitely come up and visit us! I’ll try and call you tonight after the kids go to bed!